THERE ARE NO STATISTICS on how many gay men are producing children through surrogacy. Ray Drew, head of Gay and Lesbian Parenting Coalition International, a US-based support and advocacy group, says America is in the midst of a "Gay-by Boom." He says most are the children of lesbians and sperm donors, or of gay men who have arranged with female relatives or friends to conceive a child through artificial insemination. But Drew estimates that a thousand or more children have been born through arrangements involving in vitro fertilization and surrogates. Dozens of commercial surrogacy and egg donor programs have sprouted up around the country in the last decade, but there appears to be just one agency devoted exclusively to arranging surrogacy for gays and lesbians. Gail Taylor opened Growing Generations in Los Angeles two years ago. Taylor, 29, is a lesbian and the mother of a year-old daughter. Taylor worked at a prominent California surrogacy program before striking out on her own. She says she knew of gay men who wanted to have children, but were told by surrogacy agencies, "We've never done it [for gay men] before, and we're not going to start with you." Gail Taylor is director of the Los Angeles surrogacy program, Growing Generations. She says the agency has gay clients from around the world wanting to start families. The process is costly. Taylor says the fees average $50,000, much of that going to medical and legal fees, and more than $10,000 being paid to the surrogate. Growing Generations celebrated the birth of the first baby born through the program this spring. A handful of male couples are on the waiting list. Taylor's business partner at Growing Generations, attorney Will Halm, knows first-hand about the tribulations of starting a family with another gay man. Before Halm bought into Growing Generations, he and his companion, cardiologist Marcellin Simard, spent nearly a decade trying to find the right surrogate and egg donor to have a child with � mostly without the help of a surrogacy agency. Their struggle eventually produced Malina, an inquisitive pixie who (like any self-respecting toddler) ignores all fatherly pleas to pick up her toys. This clearly frustrates Daddy (Will) and Papa (Marcellin). Will Halm of Los Angeles - the father of a two-year-old with another gay man and a surrogate mother - talks about how straight people react to him as a gay father. Even though Halm and Simard live in Beverly Hills - a cultural other-world known for tolerating uncommon domestic arrangements - their situation still challenges the definitions of family. Halm explains with mild exasperation: "After our daughter was born, the first question everybody asked was, 'Who is the father?' I think that's a really insensitive question given the fact that we both helped create this child; we both consider ourselves father. They didn't ask who the biological father is, who was the sperm donor, they said,'Who is the father?'" Marcellin Simard, 2-year-old Malina, Will Halm, and Growing Generations Director Gail Taylor. Only close friends or family know which of the men, both 46 years old, was the sperm donor for Malina. Halm and Simard are fathering a second child, due in September. The other man will be the genetic father of that child, who was conceived with a different donor and a different surrogate. 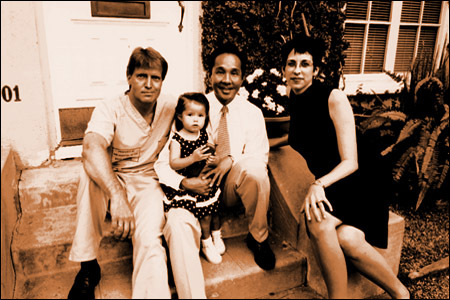 The men sought out egg donors who, separately, approximated the couple's ethnic backgrounds (Halm is Korean-American, Simard is French-Canadian). So, the Simard-Halm genealogical charts will look more like a web than a family tree. Malina and her sibling will have no genetic connection to each other, but will be linked by genes or gestation to three adults: the sperm donor, the egg donor, and the surrogate. The kids will learn these details as they grow old enough to follow the complicated strands of information. Elizabeth is the surrogate mother carrying Will Halm and Marcellin Simard's second child. Elizabeth is a 33-year-old mother of two. At first, her husband objected to her carrying a child for a gay couple. But once he met Halm and Simard, he and Elizabeth realized how much in common the two couples have as parents.